The sudden loudness of my alarm pierced the silence that surrounded me in my tent but the camp was far from quiet. It was 2330 and I had spent the last 4 hours staring at the roof of my tent completely unable to sleep until the last minute. The monotony only broken by 2 trips to the all too distant toilet block in the freezing, pitch black night air. Because of the 40 degree angle of this part of the camp and the ridiculous amount of loose rocks and numerous tents strewn between us and said toilet block, the walk resembled a krypton factor assault course on steroids played out in the dark. It’s a miracle I didn’t break my neck and bring numerous tents crashing down over their owners with the amount of wires I tripped over. Our slice of paradise clinging to the side of the mountain. Nobody had slept very well since we had retired to our tents just after dinner at 7pm. Partly because of the adrenalin surging through our systems at just the thought of what we were about to undertake and partly because of sleeping at this altitude. 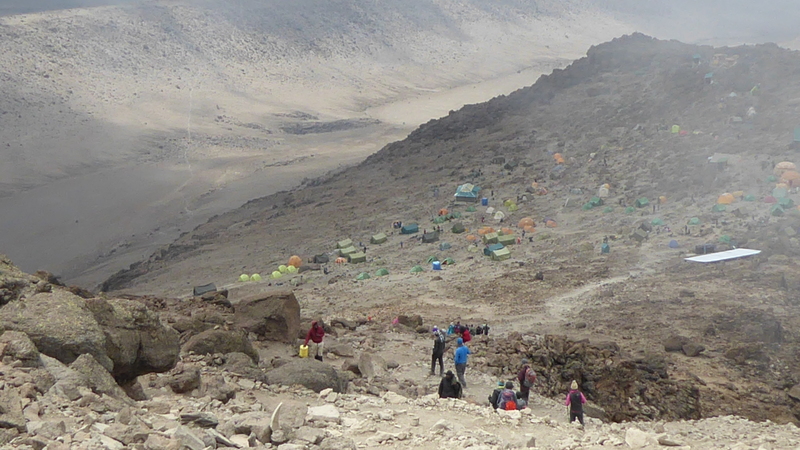 Barafu Camp spreads itself out over a very wide area 4680 meters above sea level. For the locals this is nothing but for those of us more “altitude challenged”, born and raised much, much closer to sea level, our bodies find it very difficult to adapt to these surroundings in the time it has taken us to get here. Two of the more widely recognised effects of this struggle our bodies go through is loss of appetite followed by insomnia. At this point I hadn’t eaten a full meal in 3 days and this was the 2nd night in the last 3 that I had not sleep so facing our final uphill challenge I felt so tired yet fired up at the same time. I can deal with not eating and being keenly aware that if we did not eat we would not be allowed to even attempt to summit I had been trying my best to appear to be eating normally which hadn’t gone unnoticed by my guide and pretty much the rest of the group. The feeling of lethargy that we all experienced that night is very difficult to explain to anyone that hasn’t been at altitude. You don’t necessarily feel tired but at the same time you have no energy to do even the simplest of things like brush your teeth. Our bodies were crying out for food but I felt that if I put one more spoon of plain rice into my body I would be violently sick. I probably wouldn’t have been but the feeling was so great I all but gave up eating for nearly 3 days. My pre summit dinner consisted of half a bowl of soup, a glass of water (I couldn’t even stand the thought of coffee) and a couple of spoons of hot meat stew and rice. I felt exhausted yet when I finally made it into my sleeping bag I couldn’t sleep. It was incredibly frustrating lying there for 4 hours knowing that I was about to undertake one of the toughest physical challenges of my life yet I couldn’t get the rest I was so desperate for. Reading any blog or review on climbing Kilimanjaro, no matter which route you choose, you will hear the same thing from everyone. Summit night is absolutely brutal but it’s not necessarily for the reason you think. Climbing up for 8 hours was hard, very hard but the thing that got me was the descent. The 2 hours returning to camp very nearly broke me. The last 4 days had been training for the next 10 hours. It is by far the hardest thing I have done in my life and it was only the belief in myself and that of my guide that got me through it. I knew that not being as physically fit as I should be would play a part but the mental challenge I was having with myself that night brought my chances down to 50/50. Starting off either just before or just after midnight you first realise that the route up to Stella Point, for most people it’s the first milestone at 5739 meters, is more like the motorway of mountain climbing. All you can see in the thick darkness is a string of headlights snaking back and forth up the mountain. It’s very hard to get lost tonight with the amount of people who are attempting exactly the same thing as you. Some will make it, some won’t. Their mind telling them that they cannot go any further but more often, as in the case of one of our group, their bodies give up before their mind, making it too dangerous for them to go any higher. 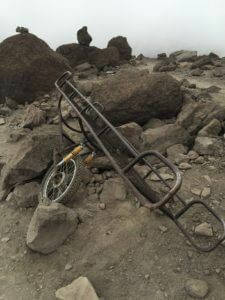 Some push themselves to the absolute limit and you will see, on more than one occasion on your summit attempt, two porters book-ending a climber, hoisting them up off their feet by their armpits and running down the mountain to get them to a safer altitude and an oxygen bottle while the climber is almost delirious and in fits of tears in the belief that they can make the final last push to the summit. These guys do this pretty much 2 or 3 times a month in the main climbing season and they know when the warning signs are saying no more. Trust their judgement. The first couple of wailing climbers to go hurtling past me were a little unnerving but just concentrate on your own personal fight with the mountain. Remember climbing this mountain is more about the mental strength than the physical ability for the vast majority of people undertaking it. 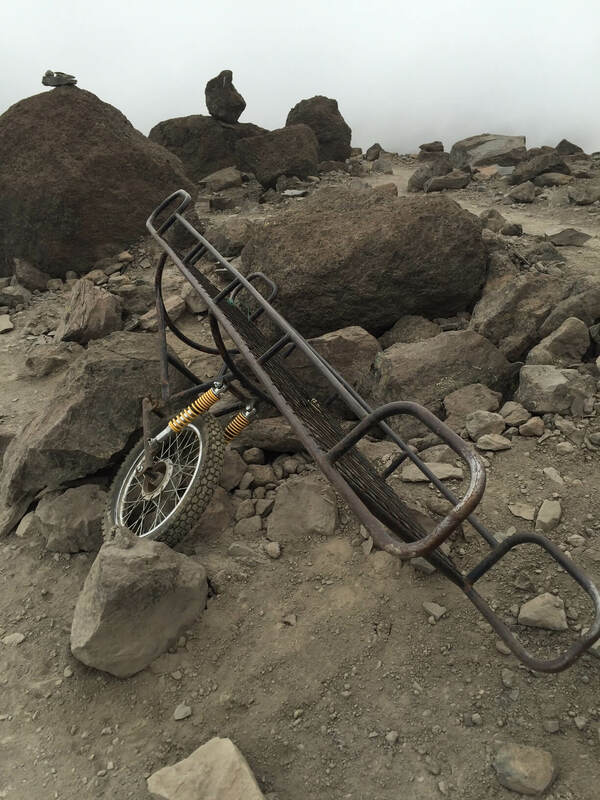 If you’re unfortunate enough to need assistance on the higher slopes of the mountain you will find yourself on one of these beauties and and express route back to civilisation. Our climb started about 0030 in the freezing cold of the night. If you are using a water bladder you will need to make sure that the drinking hose is insulated against the extreme cold. This can either be in the form of an insulating jacket around the pipe like I had which managed to keep the ice crystals away until the last hour before sunrise or it could be something more simple such as wearing your bladder under your jacket instead of in your day bag as usual and keeping the hose close to you for the body heat. Anything that is in your backpack will end up freezing as you make your ascent. For the first 6 or so hours you will not only be fighting the extreme altitude but the extreme cold. Cloud cover, at least in September when I climbed, evaporated late evening returning late morning for the afternoon meaning your summit attempt will possibly be set against the crystal clear, yet sub-zero, and sometimes blowy night sky. While this makes for some great views once the sun rises it is harsh on you and your gear. The pace was slow, so slow it took us nearly an hour to clamber over the last ridge of the camp before the climbing proper could start. Everyone was quiet, aware of the seriousness of this moment. The guides selected to take us to the top tried to keep the atmosphere jolly but we were here for the business of getting to the Roof of Africa and most of us weren’t in a sing-song mood even if we could sum up the energy. Not everyone goes to the summit. The main guides are there to ensure your safety and a few porters are selected to help with carrying day packs for those that are struggling. The general ratio is a minimum of 1 guide or senior porter per climber plus a couple extra porters just in case. 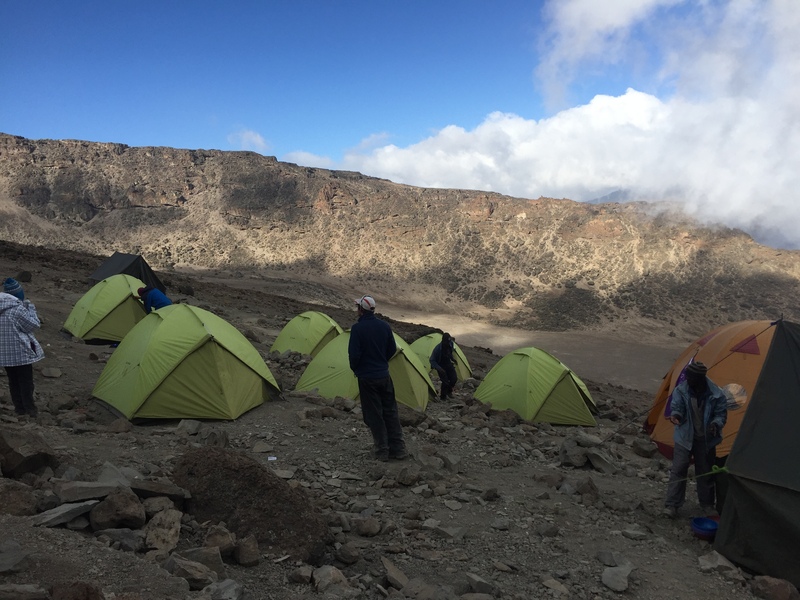 Meanwhile the rest of the porters and the cook are left in camp for security because you will only take the minimum in your day pack, perhaps a couple of layers, water, camera, sun screen and a packed lunch for breakfast to have at Stella Point or on the way round to Uhuru Peak. 2 hours in and we had cleared camp and were officially part of that thin line slowly making its way up the mountain. Looking back down towards camp we could see a myriad other climbers starting their first painful steps out of camp. Looking up ahead of us parts of the mountain were silhouetted by the bright headlamps of our fellow climbers. Stella point still looked so distant and unobtainable but we were determined. The pace for some of us was frustratingly slow, but necessary. The relative monotony of staring at your illuminated feet for hour after hour was broken around 3 hours in when we arrived at a small boulder field meaning we had to find the safest way around and over the mini mountain which led to some laughs and banter with the rest of the group. Just as on the Barranco Wall, it was a great laugh and a fun way to spent 30 minutes before our first official rest stop. After the pounding our feet had gone through over the past 4 days we were desperate for a proper sit down but breaks are kept to just 5 minutes. It was only when stopping you can truly realise how perishingly cold it is in the dead of night up here. Cold and dry. My mouth felt like I had done a marathon through the Sahara Desert and I wanted to down my water but the trick is to drink little and often, 1 or 2 sips every 10 minutes which is easier said than done when your mountain guide has taken control of your day pack to let you concentrate on the important task of putting one foot in front of the other and then taken off up the mountain like a demented gazelle in slow motion. “Ready to go?” , our head guide asked. “Not really”, was our answer but we dutifully got to our feet and started putting one foot in front of the other. You start thinking of anything to break the boredom of making sure your next step is as steady as your last. It’s the only way to survive this 8 hours up the mountain with nothing to see apart from what is illuminated by your headlamp until the sun rises from behind Mount Mawenzi (just before 6am in September). I don’t think I’ve been in the company of so many people, united in one goal, yet felt so utterly alone at the same time. Hauling ourselves up off the rocks we realised tonight was going to be more about the mental strength than the physical exertion. The pace set by our guides was deliberately slow. At first, with our eagerness to get on with things, it was a little frustrating but as the night wore on and the minutes ticked past we found ourselves taking 10 steps then pausing, our lungs wanting to burst out of our chests, gasping for air yet desperate for some water. You won’t find many photos online of the hike up to the summit. The inky blackness of the night and methodical physical pain we were all going through put paid to any chance of even attempting to capture the moment for posterity but the one thing that never escapes anyone that has been to Stella Point or Uhuru Peak is the memory of summit night. 3 hours in, the first couple split from our group. Obviously physically fitter than most of us, they enjoyed hiking in the mountains near their home. Taking a guide with them (you’re not allowed to break off on your own) they started powering away from the rest of us until they disappeared in the darkness while we’re were stopping yet again for a quick break. 45 minutes and 3 breaks later it would be my turn to break free as the group stopped for another rest break I stayed standing which my guide took as a sign that I was ready to go. He asked me if I wanted to continue and while every fibre in my body wanted to say “no”, I found myself inexplicably replying “yes”, and we were off. With some clear distance between me and the rest of the group I needed something to aim for so I promised myself I would see the sunrise from Stella Point which at this moment seemed insurmountable but I had heard the sunrises on a clear day were spectacular and after all this effort I didn’t want to be missing out. The next 2 hours were spent pushing myself further that I ever thought I could. With the air now so thin my body needed a small break every 15 steps or so but as soon as I stopped my guide would be on me to carry on. I guess he saw in me a determination that at that point in time I was unable to see because all I was interested in was trying to breathe. The sun finally appears over Mount Mawenzi after one of the longest nights of my life. I didn’t quite make Stella Point by 550am but I had the next best sunrise you can have. 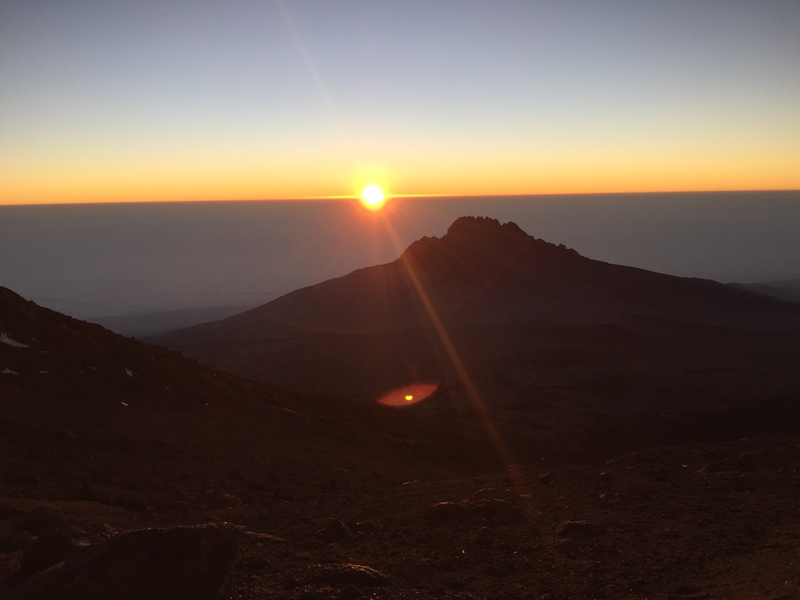 About an hour short of the first official summit (but only about 150 meters in vertical distance) there is a small plateau, popular with many guides who make it their main stop to sit and reflect and watch the sun rise from behind Mount Mawenzi. The temperature difference in the seconds since the suns rays finally touched my face was jarring. I almost instantly went from being freezing cold, barely able to feel my toes, to sweating in my 4 layers. With the sun came a new lease of life and a determination to succeed. We had been climbing for what felt like an eternity in the pitch black cold of the night and now the mountain was illuminated all around us. Looking up we were so close to Stella Point I knew I would make it but Uhuru Peak was another matter. Looking back down I was surprised that it had taken us 6 hours of climbing to get to this point and yet we could still make out Barafu camp. Using my superzoom camera I could even make out my tent in the maze of others dotted about the site. Had we really been this close to our goal since we arrived yesterday afternoon? 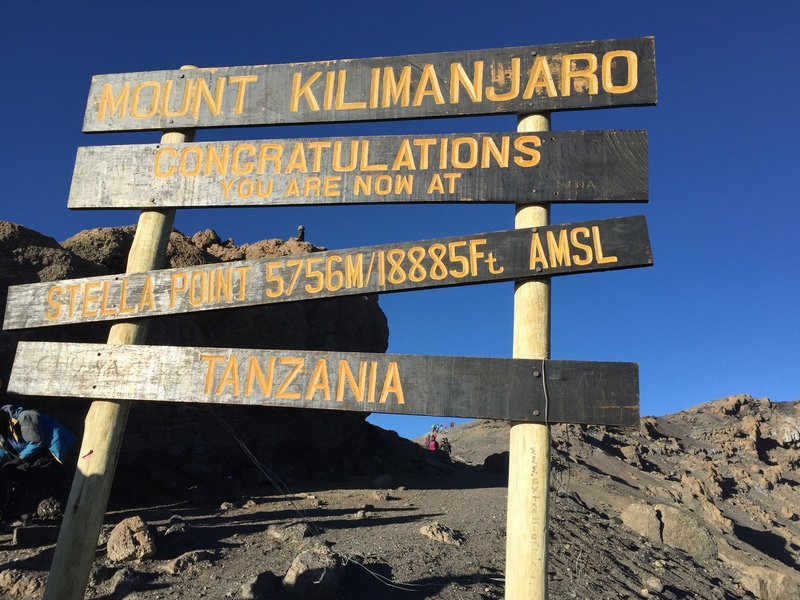 The answer to that question is, yes; your fight on summit night is not necessarily the mountain but the extreme altitude. 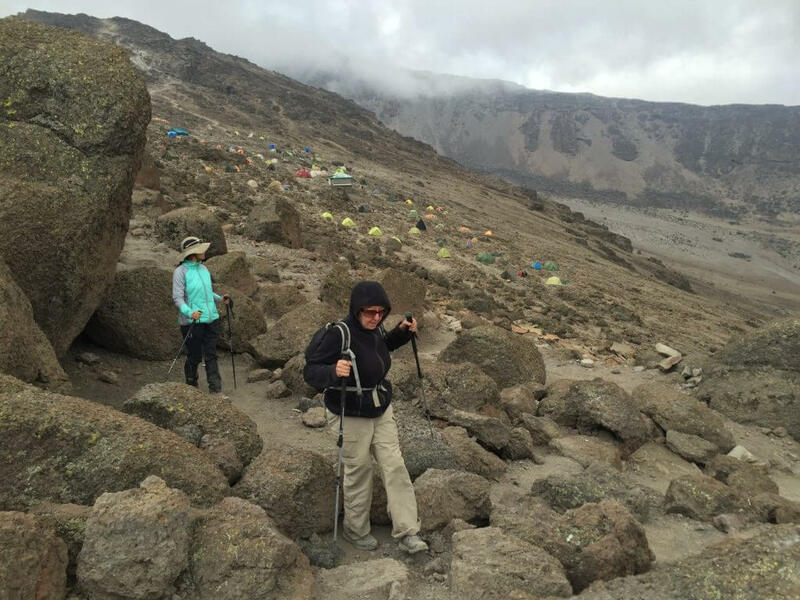 The kilometres wide caldera of Kilimanjaro is agonisingly close to the last camp. If it were at sea level most reasonably fit people would manage the scramble to the top in a little over 2 hours but at over five and a half kilometres up it’s a different thing entirely. The fifteen minutes sitting on that boulder just under Stella Point flashed by and it was suddenly time to go. I didn’t have a clue how much distance I had put between me and the rest of the group, but I had a cunning plan forming in my mind. Get to Stella Point first where I could have a proper sit down, finish of a little more of my breakfast and wait for the rest of the group to catch up where we could then get the triumphant group photo of all of us conquering the mountain. Heaving myself over the final brutally steep section, encouraged by others that were already on their way down that, “it’s not far now”, and, “you’re so close, keep going”, and, “you can do it” I breathed a huge sigh of relief. I had been hearing variations on the motivational sentences for the better part of the last 40 minutes and to be honest they had started to grate a little. I was spending the precious little energy I had left stopping, smiling and saying thanks instead of getting my head down and getting on with what I knew I was capable of doing but the truth is everyone on the mountain becomes an extended family. On your way down you can see people struggling, their red faces trying to hide the physical pain they are in and you feel obliged to offer some words of encouragement because 2 hours earlier that was you. You know the pain they are going through because you have been through it yourself. Finally, after hours of exertion we arrive at Stella Point. My cunning plan backfired spectacularly when I was informed that we were not allowed to wait for the rest of the group before making our last push for the summit. Because of the extreme altitude we were now at it would be too dangerous to hang around for too long and, if I wanted to reach the Roof of Africa, it would have to be just me and my guide. Cresting Stella point at last everyone stops to admire the view over the caldera. To the left, Uhuru Peak. Begrudgingly, slowly, I made my way onto my feet once more. Taking a couple of minutes to take in my first proper view of the 2.5km wide caldera I was stunned at how barren it actually was and also how busy it was up here. There were people flat out all over the place, clearly exhausted from their very early morning exercise on what must be the worlds ultimate stair master. Doing an image search of Kilimanjaro will bring up stunning photos of the ice caps surrounding the mountain. The reality now is they are receding fast and from Stella Point in the main climbing season you can only make out the barest glimpse of the very top of the Northern Ice Field peaking above the crater rim. Looking at some blogs I had the somewhat romantic vision that we would be clambering up through knee-high snow shadowed by towering glaciers on both sides. The reality is far from that if you climb in the drier peak months around September and October or January to March with less rain and cloud. Climbing in the wet season in November/December and April/May you may have a very cold surprise. Rebmann Glacier is the first of the Southern Ice Field that you will encounter as you make your way around the crater rim. If glaciers are your thing, and also a chance to climb to the rim of the Deutsch Crater and look down on the 350m deep ash pit, the heart of Kilimanjaro, some companies do operate longer private treks allowing you to camp at the little used Crater Camp near to the fast disappearing Furtwangler Glacier in the caldera but a private tour with more days on the mountain will quite significantly bump up your initial spend because you will have to allow time to acclimatise to your surroundings if you want to stay up at this height. Lunch with a view! Sitting on a ledge looking out over the Kibo caldera while eating my apple. 20 minutes into a nearly 1 hour slog from Stella Point around the rim we stopped to finish our lunch/breakfast. Sitting on a rock with my feet dangling it is without a doubt the best breakfast view I have ever had. The Inner Core clearly visible in the barren landscape of the caldera with only the peaks of the Northern Icefield far in the distance. This early in the day the cloud had not yet had a chance to form, instead blanketing the world below us while the searing sun and bright blue sky illuminated everything around us. From up here you can also make out the curvature of the Earth. It was magical. 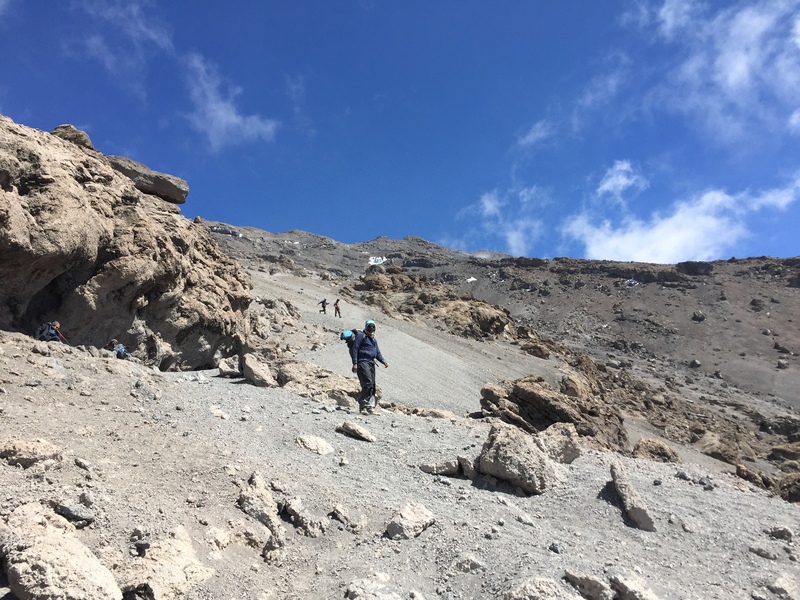 The walk to Uhuru Peak from Stella Point is not steep at all. Your battle now is solely with the altitude. Putting my now fully eaten apple core back into my lunch box and into my back pack I was surprised to see the first couple that had broken away from us so may hours earlier appear in front of me. They had beaten me to the peak by 20 minutes and were now making their way back down with the broadest grins I had seen that morning. Elated they encouraged me to go on, as did almost every other climber I passed on that last push to the summit. The gradient itself isn’t all that steep but it was the slowest 20 minutes of my life. No matter how hard I tried to go a little faster my body just couldn’t give any more plus the receding, yet still stunning view of the Southern Ice Field clinging perilously to the sides of the mountain as it slipped away beneath us caused me to stop and take in the view a couple of times. The final push. Almost at Uluru Peak with my guide leading me and the Southern Ice Field on the left. Reaching Uhuru Peak at 8:09am after what felt like the longest night of my life was a surreal experience. I didn’t feel elation as you would expect. I had a sense of achievement for sure but doing so much of the last few hours predominantly on my own after starting out as a group was a little disappointing. It didn’t take anything away from the experience but I think at that point I was so tired I didn’t have the energy to celebrate and in the back of my mind I couldn’t stop thinking that now I was here I had to get back down and I wasn’t sure how I was going to do that when I was already so completely exhausted. The Roof of Africa. 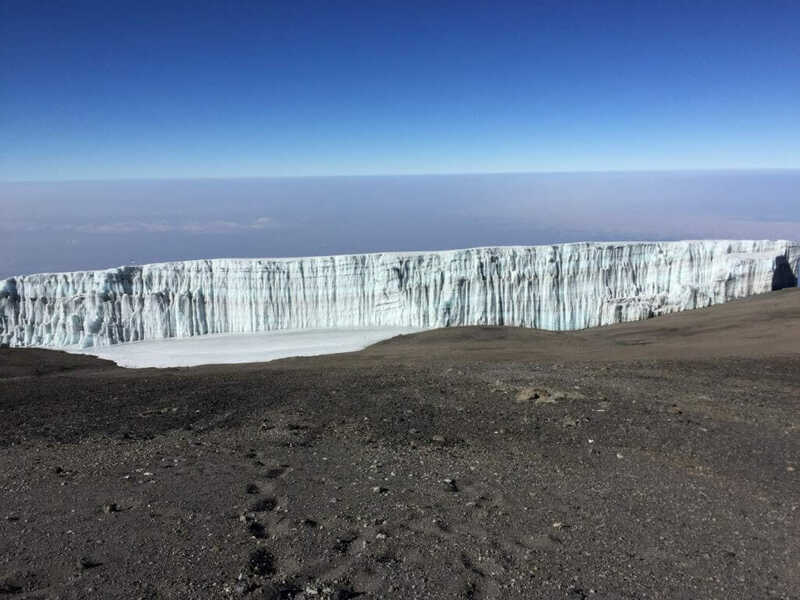 Uhuru Peak, 5895 meters/19341ft above sea level with the Southern Ice Field spreading out below. The obligatory photos taken and congratulations given (even though, for my guide, it was the second time he was standing here in 10 days) for myself and the 3 German guys that made it to the Roof of Africa at the same time it was our first (and probably last) time we would be here along with thousands of others, but that didn’t make it any less special. Looking out over the 2.5km caldera of Uhuru Peak. In the caldera you can see the melting remnants of the Furtwangler Glacier, the Inner Cone containing the Reusch Crater with the Northern Ice Field in the distance and Mount Mawenzi towards the right. Turning round to head back the way I had just come after roughly 12 minutes at the top of the African continent I was surprised at the lack of people heading this way after the amount of people who surrounded us at Stella Point. There was still no sign of the rest of my group but I couldn’t delay my descent any longer. Perhaps the peak hours of foot traffic had passed for this morning? What ever the reason I was glad that, for the briefest of moments, I had this mountain to myself. Looking down on the Southern Ice Field while returning to Stella Point. Almost reaching Stella Point I could make out the thin frame of Richard, a super fit marathon runner from Boston, the altitude clearly taking its toll on his body but the steely determination in his eyes told me all I needed to know. After exchanging a couple of words he was off again. Not far behind him was the remainder of the group. I was roughly an hour ahead of them and from the grin on my face they could tell I had made it. Hugs and congratulations all round I didn’t want to delay them any longer and bid them farewell until we all caught up for lunch back at camp. Standing at the top of Stella Point I was shocked that the way down was the same, more or less, as the way up, albeit more of an express route. What ensued was just over 2 hours of running down a scree slope. I was completely unprepared for the physicality of it. I hadn’t brought any snacks with me to boost my energy levels and my breakfast was now a distant memory. I was operating on fumes and with the sun bearing down on us, the going was very hot indeed. There is a knack to getting down in once piece without breaking your neck. Make sure you get a short lesson from your guide before you start running. It’s more of a small jump once you have spotted your landing while not having one foot on the ground for too long because the loose rock under your feet will give way. You need to find a rhythm, a lot like how you would slow yourself down when parallel skiing. After 2 hours of this though my technique had gone the way of the dodo and my patience was wearing thin much like the soles of my walking boots. 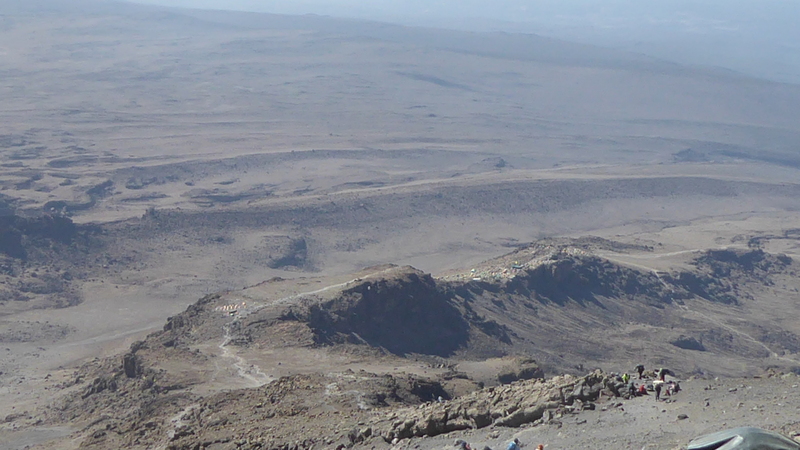 Looking down on the sprawling Barafu Camp from Stella Point. Going up was hard, probably as hard as I had expected it would be with the slow pace but, for me, the 2 hours running down that scree slope was far far harder. By the time I reached my tent around 11am my feet were on fire; every step felt like I was stepping on a thousand pin sharp needles. I had shooting pains up my back and my knees were throbbing. Utterly exhausted and in agony I just barely had the energy to take my boots off before I fell fast asleep. I had conquered the mountain but it had taken it’s fair share out of me. 30 minutes from arriving back in camp, this picture hopefully illustrates how steep some of the sections on the summit attempt will be. 3 hours later a knock on my tent flap and the usual bowl of warm water to wash with signalled that it was lunch time. Our day was not yet over; after lunch we had to vacate Barafu Camp to make room for the next trek weary set of climbers. Shortly before 3pm I sat in my tent looking at my, by now, beige walking boots, caked in the dust from the exertion of the past several hours. I wanted to scream. I wanted to throw them off the nearest cliff but I had to put them back on. We had, at best, 3 hours more hiking today to get to our last overnight stop on the mountain. Tired and weary, making our way out of Barafu Camp heading down the Mweka Route. The 3 hour sleep, hearty lunch and loss of altitude had given me some energy but I was still in crippling agony from the 2 hour descent. Every step made more painful by slipping on the loose rock underneath my feet and we weren’t even out of camp. I could now see why hiking boots not shoes are very heavily pushed to those wanting to climb. I hiked the Inca Trail in walking shoes no problem despite the warning about the “Gringo Killers” on day 2 but this mountain is on another level entirely. You definitely need the ankle support you only get from a very well made pair of broken in hiking boots even though at this particular moment in time my relationship with mine had almost ended in divorce. Following the ridgeline down from Barafu Camp crossing the Southern Circuit briefly you start to feel more awake as the altitude drops off and more oxygen gets into your blood stream.. The Mweka Route is the express way off the mountain, an almost straight line to the small village at the Mweka Gate with 2 camps. You will generally decide as a group which camp you will stay at. Millennium Camp is the closest and around 3 hours or so from Barafu. 90 minutes to 2 hours further down is Mweka Camp. We chose to stop at Millenium Camp. The route down follows, for the large part, a barren, rock strewn dry river bed (although in the wet season I imagine this may change). Looking back at the summit fast disappearing behind you its incredible how much altitude you lose in such a short amount of time. The mountain feels as though its closing in around you, now in the afternoon the cloud has returned after a morning spent looking down over it from the summit and the grey sky is a stark contrast to the vivid blue sky illuminating the glaciers at the peak. The temperature drops again entering the windy cloud layer meaning a couple of layers in your day pack, no matter how dirty by now, are a good idea. 40 minutes from camp crossing one last ridge we think we can make out the outline of the camp in the thickening shrubbery which helps shield us from the late afternoon breeze but makes a toilet run in the dead of night more adventurous than it should be while still looking out for the guide lines of other tightly packed tents. The sight of camp spurs us on and in what feels like no time we are back in our tents. 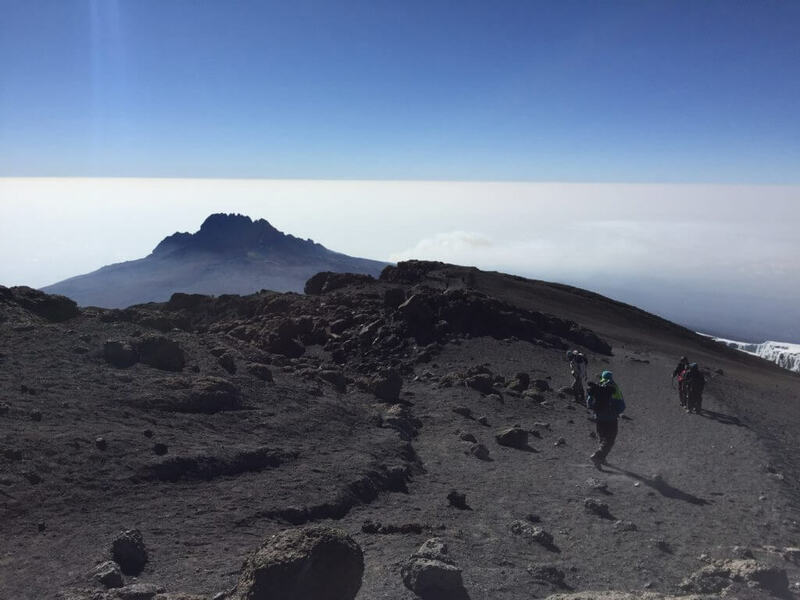 We’ve only lost a couple thousand feet from Barafu Camp but combined with our ascent we have travelled an astonishing 10,500ft vertically on foot in the last 15 hours. Our late arrival in camp thanks to some very, very sore feet brings forward afternoon tea but we are all in high spirits despite our physical pain. What makes summit night so dreaded? It is the combination of two very different parts to one very long day. Already exhausted by just getting to this point and probably hungry but unable to eat as much as you would like you first have to find the mental strength to get up the mountain in the dead of night with no way of really knowing how you are progressing. You just have to have faith that you are making progress no matter how slowly. The pace is painful at times, but necessary. Those 8 hours or so up to the summit are not particularly strenuous in a physical way, you are fighting the altitude, an invisible enemy; an enemy that, if left unchecked, can kill you so trust the judgement of those around you. The second is more physical in that, utterly exhausted, you first have to get back down the mountain and on only a couple of hours sleep you have to find the physical and mental strength to get out of that sleeping bag and hike for hours when every muscle aches and all you want to do it sit down. You have never been so tired in your life. Hearing a muffled squeal from inside the tent a couple of people rush in to find me covered in powdered milk, a consequence of my new-found energy and eagerness to open the new can and the drop in altitude raising the pressure inside the can to cause a small explosion and resulting cat caught in the headlights look until I can dust myself off while the others try to hide their obvious delight at my predicament. It’s a hilarious end to a memorable time on the mountain and thankfully no photographic evidence exits of this little faux pas. Plenty of stories are shared over the dwindling coffee supply. The altitude is down which means the energy levels and appetites are back and a pack of sweet biscuits, kept back by the porters as a surprise for our last evening, are wolfed down in quick succession. There isn’t much to do in camp while waiting for dinner. The toilet block, by far the worst we encountered on the mountain, should have been condemned years ago. The overwhelming stench wafts over parts of the camp in waves so everyone leaves it until the last possible second until they have to make a visit. One of the group can’t maintain composure on her last visit early the next morning and also loses breakfast down the hole so near to maintaining dignity all the way through the experience. Spirits are high over our last dinner and there is a celebration when the blood oxygen machine is brought out for the last time to record the final results against our names. A friendly cheer goes up to Olli for maintaining the highest blood oxygen level through his time on the mountain. Stories are shared of our own individual battles with the mountain and plans are made to reward our support team for the fantastic work they have done for us. Without them none of us would have made it to the summit and for that we will be forever grateful. Retiring to bed there is a tinge of sadness in the air knowing that in a few short hours these people we now proudly call family will be going home to their own families. Coming off of two straight ascents they haven’t seen their own families for the better part of 2 weeks. It’s what they have to do to support them. The hours are long and hard, the conditions are tough yet they carry out their job with utmost joy and dignity and for that they should be applauded.